Wonderful a book about my island. Liz Johnson does an excellent job of creating the Red Door Inn in Rustico PEI , near Cavendish. I am very proud of my island as l read this book. Anyone who loves a good romantic story about a beautiful island and how the island can heal your soul, you have to read this one. Can't wait for the next book to come out this summer. Author Liz Johnson did a good job of portraying the welcoming hospitality of the maritime people. I enjoyed the seaside setting of North Rustico. Although The Red Door Inn was an enjoyable story as a whole, I really struggled with it in the beginning. The reason for this is because of the severe panic attacks that often came over Marie, as a result of her past trauma. As someone who experiences panic attacks myself, it was absolutely nerve wrecking to read about. The Red Door Inn is a Christian novel and therefore wasn't graphic, however Marie’s trauma may be a trigger for those who have had similar experiences. For this reason I wouldn’t recommend it to those who may be uncomfortable with difficult subject matter. Although I would recommend it to others who enjoy the contemporary Christian fiction genre. 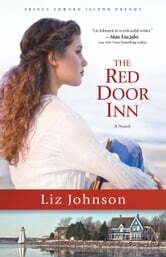 I was sent a copy of The Red Door Inn (Prince Edward Island Dreams #1) by Liz Johnson from the publisher in exchange for an honest review. A charming novel with an intricate plot and very believable characters. The story flows well and the plot is intriguing. A very nice read. So moving and inspiring with realistic characters. A story that gives us lessons on how working together can bring happiness and satisfaction in a common goal. I did not want to put this book down and can't wait for the next one.